Cofferdams are normally temporary structures designed to create a dry working environment in a body of water. They vary in design from simple earth and rock dykes to pile-driven interlocking steel sheets. Once the protected structure or facility has been built (e.g. 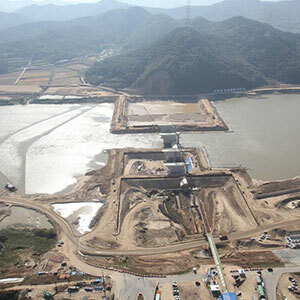 a bridge pier) the cofferdam is removed and the surrounding water returns to its original state. In view of the risks of collapse, flooding and structural damage, both installation and removal processes have to be planned with the same degree of care. Calculations have to consider the loads imposed by soil, water (including currents and waves), ice and of the construction vehicles and equipment. 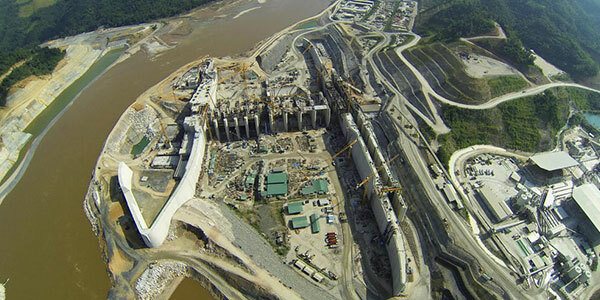 In the case of hydropower sites the risk of seismic activity is also a consideration. Scouring of the river banks can also occur as currents deflect. Floating cofferdams can provide an substitute solution for repair or maintenance to an existing structure where, for example, the water is too deep or there is some other impediment to the traditional approach. KGAL engineers have experience of designing both types of cofferdams and can advise on all elements including materials, tensions, load factors and, where appropriate, an alternative approach using caissons.